It's fair to say that Ghost of Tsushima was a surprise back at E3. Not the game's existence, of course - it was announced one year ago during Sony's Paris Games Week showcase. No, it was more the reaction that Sucker Punch's samurai game received, standing toe-to-toe with Spider-Man, The Last of Us and Death Stranding as one of PlayStation's four tentpole titles, and emerging a favourite among many. Of that quartet, very little was known about Ghost of Tsushima - arguably even less is known about Death Stranding, despite the number of trailers, but that's another kettle of bewildering fish - but the E3 gameplay demo offered our best insight into the open world title, and even propelled it into the GamesIndustry.biz E3 Awards as the event's One To Watch. However, while E3 was enjoyable for players and press to watch, it was pure relief for creative director Nate Fox and his team. "Sometimes it feels like you're kinda working in a cave, in isolation, so to finally show people is a great feeling"
"E3 was a great time for us at Sucker Punch, in large part for just making it," he tells GamesIndustry.biz, taking time away from his speaker duties at this year's View Conference in Turin. "I think it was really clarifying to see this game we've been working on for years made into something that we were proud to show the world. Sometimes it feels like you're kinda working in a cave, in isolation, so to finally be able to get it out there and show people is a great feeling." Aside from the stunning visuals and meaty sound design, perhaps the standout aspect of Ghost of Tsushima is its setting. Taking place on the titular island, situated halfway between Japan and the Korean peninsula, the game transports players to 1274 and casts them as one of the last samurai, fending off a Mongol invasion. As a backdrop, it's a breath of fresh air in an industry that still sets many of its biggest titles in the familiar grounds of the West, either in the present day or the near future. But, following Sucker Punch's work on the super-powered Infamous series, Fox and his team were keen to venture into unfamiliar territory. "We were certainly very excited to make a game set in feudal Japan, because it brings up a lot of romantic images in our mind," he says. "Part of the fantasy around feudal Japan is being a samurai - that's an exciting job to have in feudal Japan. I do think it's under-utilised. I don't know why more games aren't set there, it's so appealing." 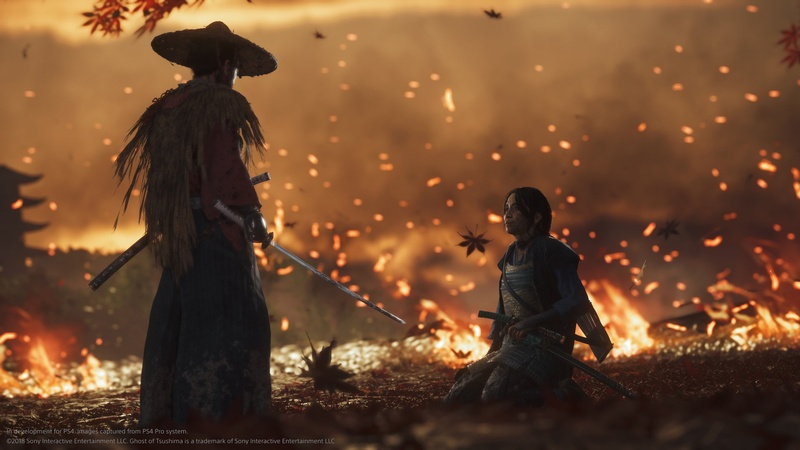 Ghost of Tsushima isn't the first game to explore that setting, of course, but typically it remains the playground for Japanese developers, who draw inspiration from their own history to recreate the period. A Western developer such as Sucker Punch might be considered less qualified to delve into this era, then, but Fox assures the studio has "absolutely tried our damnedest" to make the game feel authentic. "Sucker Punch is good at making gameplay, but we are not cultural experts in Kamakura-era Japan. We recognise this"
To do so, the American team has partnered with experts in various fields to thoroughly research life in 13th Century Tsushima, while speaking to fellow developers in Japanese studios "who could give us advice on cultural norms" and assist with audio recordings. Sucker Punch also consulted with specialists about wielding katanas and other fighting forms of the time, with motion consultants advising on the right way to hold a knife or more unusual items during performance capture sessions. "We rely on all these people to let us know where we're going astray," says Fox. "Sucker Punch is good at making gameplay, but we are not cultural experts in Kamakura-era Japan. We recognise this, and we're grateful to have the help." He continues: "It's been interesting working on this game because in past titles we've been able to make it up, frankly. For a superhero game set in Seattle, we knew what we were doing, but in this game we are constantly learning about Japanese culture or the norms of samurai. And it's exciting because it changes the way you work to learning in the same way that players get to learn about these things, and in fascinating detail. "Things were surprising us all the time. But that's part of the joy of the discovery of making the game. Hopefully it's something that will translate into the game as a player, that you will discover a lot of the beauty of feudal Japan." If successful, Ghost of Tsushima could be held up as an example of why AAA developers would be well served to look further afield when it comes to the settings for their games. Fox acknowledges that, while the games industry has variety, "it could certainly have more." He points, naturally, to fellow PlayStation exclusives as proof that it can help elevate a title above the rest, ranging from Guerrilla Games' Horizon Zero Dawn ("I think they took gamers to a place they've never been before") to this year's revived and revered God of War ("I'm so glad they chose to leave Ancient Greece and explore Norse mythology"). "We absolutely feel pressure to live up to the standards set by other PlayStation exclusives - but what a good pressure it is"
"Games are moving around," Fox says. "Feudal Japan just happened to be a place that, as a developer, I know I was eager to spend a lot of time trying to recreate. And as a gamer, I really wanted to play an open-world samurai game. And that's just one excellent place in history - there are so many more. "So yeah, I do think that there's a lot more spaces to play in and I wish the industry would get a little bit wider. That said, I think the industry does a pretty good job at going to places that are unexpected." As with Sucker Punch's previous work, Ghost of Tsushima is an open-world game, restricted to a single island. Other AAA open-world blockbusters continue to increase in scope, from Red Dead's five-state Wild West to Assassin's Creed Odyssey's entirety of Ancient Greece, but are player expectations increasing as well? Is there more pressure on developers like Sucker Punch to deliver a packed and responsive sandbox for them to explore? Fox maintains the studio avoids worrying about this conundrum - and the inherent feature creep it leads to - by focusing on Ghost of Tsushima's core tenet. "We really want to bring the samurai fantasy to life," he explains. "When we make decisions about what's in and out of the game, we just ask 'Is this going to make you feel more like a wandering samurai?' There isn't this pressure just to increase scope for the sake of scope. We only put it in if it helps that core fantasy of being a wandering samurai." Ghost of Tsushima has yet to receive a release date, but it's expected to be another pillar of first-party excellence for PlayStation 4. Sony has thrived this generation in terms of exclusives, with Sucker Punch following in the wake of games like Spider-Man, God of War, Horizon Zero Dawn, and Uncharted 4. "We absolutely feel pressure to live up to the standards set by these other Sony PlayStation exclusives - but what a good pressure it is," says Fox. "We want to provide players with the same joyful experience that they got from these other great games - and what's better is these other studios, they talk to us, they give us tips, we learn from each other. We feel more capable than ever because of those studios being more open with their knowledge."